Sarinda Here with the new Prima Collection by Finnabair, Sunrise Sunset. I LOVE everything about this collection. From the trinkets to the paper to the stamps, everything is stunning. First I took a sheet of "Del Sol" paper and cut a tag out of it by hand just using an actual tag as a guide. Then I tied the ribbon around the tag like a gift. I found some leaves from an old flower project that I never used and added glitter to the edges. 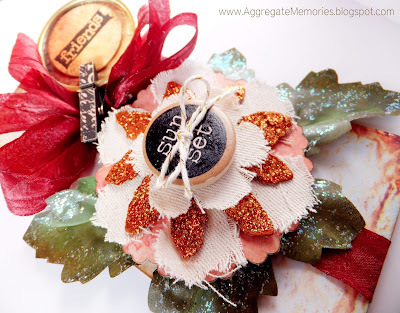 Cut out a 3" scalloped circle on my Silhouette using the same paper as the tag and also cut out some fabric and Grunge Board flowers with Tim Holtz Tattered floral die. Gluing orange glitter on one of the paper flowers once dry. I stacked the and glued the fabric and paper flowers together onto the scalloped 3" circle. Then glued the leaves onto the front of the tag and the flower cluster on top. Using the "Sunset" button to create the flower focal point. Found the "Newsprint Mini Frames- Circle" I punched 2 circles out from the same paper one to fit the frame and one smaller. 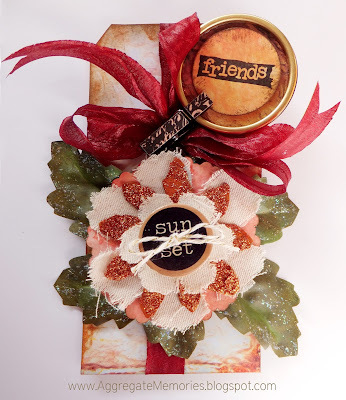 I stamped "Friends" onto the smaller circle and glued the "Frame" onto the larger circle. Glued the "Clothes Pin" to the center of the bow and clipped the Friends Frame to it. My hope is that you like this tag and that it inspires you to create with this amazing new collection from Prima and Fotobella.com.